For over a decade, my voice acting school has helped thousands of people to develop not only their voice acting skills, but also their confidence in discovering and pursuing their passion in life. There have been countless times when I have been asked if our school has a branch in the provinces, if we can take more than 20 students per batch, or if we can do one more batch for the year. 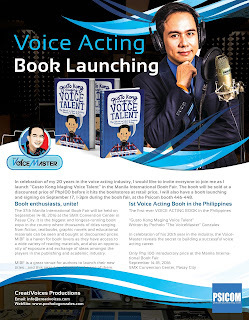 While we may not be able to reach as much people as we want with our voice acting workshop, this book will be able to do so, as it will be available in leading bookstores nationwide. It’s our very own workshop-in-a-bottle! In celebration of my 20 years in the voice acting industry, I would like to invite everyone to join me as I launch “Gusto Kong Maging Voice Talent” in the Manila International Book Fair. The book will be sold at a discounted price of Php100 before it hits the bookstores at retail price. I will also have a book launching and signing on September 17, 1-3pm during the book fair, at the Psicom booth 446-448. As I always say, the voice is our most powerful instrument. It is the only instrument that can start a war or say “I love you.” And in voice acting, there’s limitless opportunities waiting for you to discover, develop and maximize your voice.